Refrigerator pickled jalapeno peppers are spicy, tangy, and are EASY - no canning required. These crunchy pickled peppers make a great topping for nachos, hot dogs, enchiladas, tacos, and more! 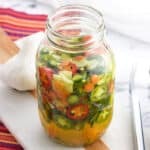 Using disposable gloves, slice jalapenos, onion, and carrots and place in a large glass jar. Crush garlic and add to jar as well. Add water, vinegar, sugar, salt, peppercorns, oregano, and turmeric to a small saucepan set over high heat. Bring to a boil and stir so that sugar and salt are dissolved. Once boiling, carefully pour into the jar over the jalapenos/onion/carrots. Let jar sit out to cool down some for about 15-20 minutes, then place the lid on and refrigerate.